We are excited and proud to host a Marching Illini and Division of Intercollegiate Athletics tradition – the University of Illinois Band Day! All high school band programs are invited and welcome to attend. 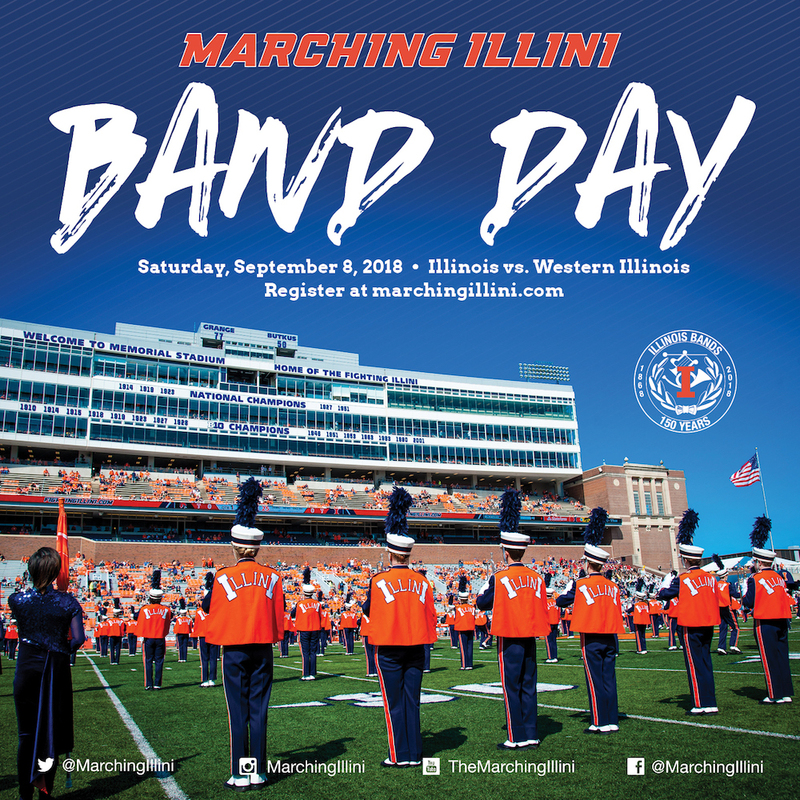 This exciting event allows high school students from across the state to interact, rehearse, and perform with the Nation’s Premier College Marching Band – The Marching Illini as well as the Faculty and Staff from the University of Illinois Bands in historic Memorial Stadium! Registration is now open. Click HERE to register today. Welcome to the 2018 University of Illinois Band Day! We are excited you plan to join us on Saturday, September 8, 2018. Please read the following instructions to help facilitate the organization of this event. On this page, you will find information regarding the day’s schedule, parking, seating, placement on the field, and additional general information. Of course if you have additional questions, please feel free to contact us at 217.333.3025. 11:00 AM Buses can begin to drop students off at the corner of 4th and Kirby…no need to be in uniform for this rehearsal. 1:30 PM Rehearsal Concludes! Use this time to get something to eat, explore campus, etc. Following the closer, horns come down in 4, MT over your left shoulder 4. Be certain whatever you decide to wear that you match – full uniform is preferred. The Marching Illini will be dressed in full uniform. There will be time for you to return to your buses to change. Changing facilities will not be provided while on campus however. Lunch and Dinner is on your own. You may choose to eat at the Memorial Stadium Concession Stands or eat something on your own. Concessions will be open following our Band Day rehearsal. There are water fountains in the stadium and water bottles are available for purchase. The Marching Illini and Division of Intercollegiate Athletics will not be able to provide bottled water for you. Please plan ahead for the well being of your students. Feel free to visit the concession stands, restrooms, etc. Do not play in the stands, but please cheer on the Illini! The Marching Illini will parade to the Education Building and will perform a post game show following the game. We invite all of you to join us if you are still around after the game concludes. Please know that you may leave anytime after the conclusion of halftime if you choose. It is recommended that all bands stay together as much as possible. Students should not be allowed to “roam” the campus by themselves at anytime during the day. There is no room in the stands for instrument cases and hat boxes so please plan accordingly. Your buses and equipment trailers will be your storage area. Once buses unload they need to take Florida to Lincoln and then to Pennsylvania where they will park between Sixth Street and Dorner Drive (on both sides of the street). Athletic Parking staff will be there to assist in parking the buses. If necessary we will use side streets on Pennsylvania to help with parking. Pennsylvania from Fourth to Sixth will be open so I FUND pass holders can park in the Law Library so be cautious when you return to your buses following rehearsal.